12 Volt Suntaqe PWB (power without batteries) Inverter Controller. With PWM (pulse width modulation). Housed in protective box with DC to 110/120 volt AC Aims inverter. Just plug in a 100 watt or larger solar panel and the Suntaqe PWB intelligently controls. The output to operate the AC power inverter directly from the sun. The Suntaqe PWB does not contain or use ANY batteries to operate. No batteries to fail or replace and no maintenance! This is truly remote and mobile AC power! When you position the solar panel into the sun and plug it in. You will get home type AC power. Battery-less 100 watt DC to AC controller. Assembly may vary slightly from picture. No batteries required, works directly from your solar panel. For remote use with 110/120 volt AC. Perfect for work, camping, RV, farm, home, shop, greenhouse, and shed use. Recommended Applications: pond or lake pumps and aerators. Exhaust fans, automatic feeders, LED or CFL lighting. During the day to be used at night. DC and AC power during the night too! Laptops, small televisions or monitors. Portable radios, fans, shavers/trimmers, automatic deer/animal feeders. (not recommended for medical equipment or critical loads). Dimensions: 8 x 11 x 4 inches. Weight (with inverter): 3 lbs, 13 oz. USB port for charging cell phones, electronic devices, etc. Green LED on front panel to confirm power on. Red LED on front panel to warn of a faulty condition. Includes a thermal cooling fan. AC output short circuit protection. Auto reset on most fault conditions. Aluminum case for optimal cooling. Continuous output power: 150 Watts. Surge power capability (peak power): 400 Watts. Output voltage: 120 Volts ac. Output waveform: modified sine wave. No load current: 0.6 Amps +/- 0.2. No load minimum operating temperature: -15 degrees Celsius. Full load maximum operating temperature: 55 +/- 5 degrees Celsius (automatic shutdown). 2 - AC Output Socket Type: single Type 2 -3 prong. Products may be slightly different than the ones pictured. If our supplier runs short of the products shown, we will substitute them for the same quality or better. The item "Solar DC to AC Power Using NO Batteries! For Off Grid, Camping, RV, Pond Pumps" is in sale since Friday, January 16, 2015. This item is in the category "Home & Garden\Home Improvement\Electrical & Solar\Alternative & Solar Energy\Wind Generators". 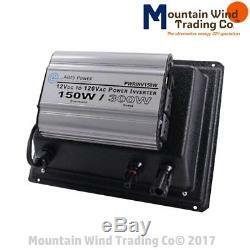 The seller is "mountainwindtradingco" and is located in Mansfield, Missouri. This item can be shipped to United States, Canada, United Kingdom, Mexico, Germany, Japan, Brazil, Australia, Denmark, Romania, Slovakia, Bulgaria, Czech republic, Finland, Hungary, Latvia, Lithuania, Malta, Estonia, Greece, Portugal, Cyprus, Slovenia, Sweden, South Korea, Indonesia, Taiwan, South africa, Thailand, Belgium, Hong Kong, Ireland, Netherlands, Poland, Spain, Austria, Bahamas, Israel, New Zealand, Philippines, Singapore, Switzerland, Norway, Saudi arabia, Ukraine, United arab emirates, Qatar, Kuwait, Bahrain, Croatia, Malaysia, Chile, Colombia, Costa rica, Dominican republic, Panama, Trinidad and tobago, Guatemala, El salvador, Honduras, Jamaica, Viet nam, Uruguay.